If we want to make changes in our life, we must first start from within- Join us to begin a journey of a new way to be. Lois’s Guided Meditation will give you simple tools to immediately begin to use on a daily basis that will help you start to create sustainable changes within yourself. The visualizations along with meditations to begin to clear the stress we accumulate therefore clearing the self. As we clear the self we begin to open and expand our awareness experiencing life in our own unique way. 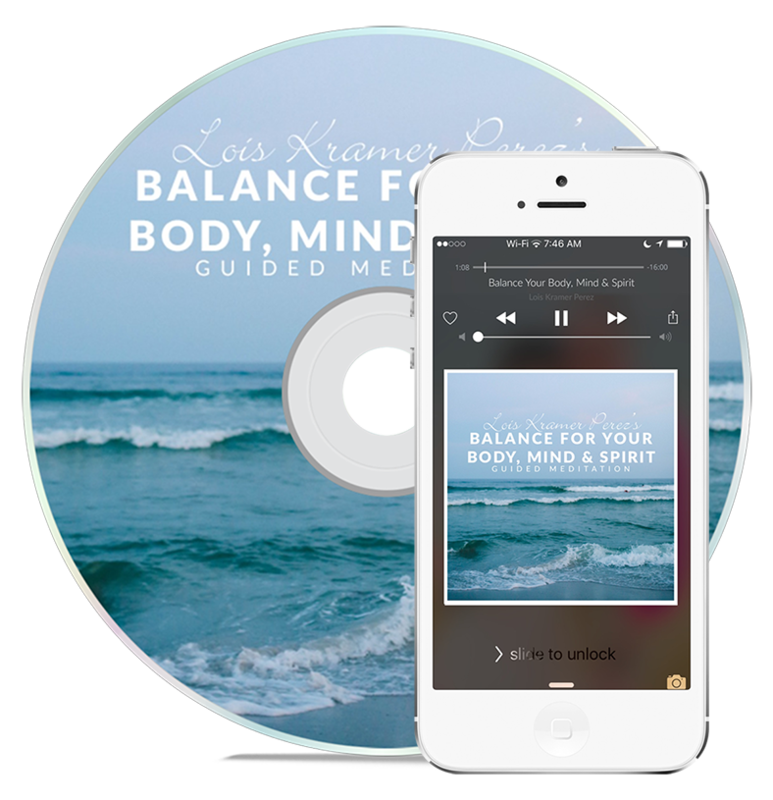 As practice is important to bring us back from chaos to balance, Lois’s students have requested a CD become available for practice in the quiet of their personal space. We are offering this CD of the Guided Meditation here and at all Lois’s live sessions and appearances. There is no meditation experience required. All you will need to do is find a comfortable quiet space to relax, close your eyes, focus on your breath, & allow Lois’s voice to guide you. The CD runs 30 minutes and is only to be listened to when you are in your quiet space. Please Do Not listen to this Guided Meditation CD while driving in a car or operating any machinery. This Guided Meditation is designed to bring all who listen, to a relaxed, quiet state. You may feel as though you have fallen asleep, but do not have any concern – all you need to hear will be heard. IMPORTANT: If you purchase the MP3 download. To download your 30 Minute Guided Meditation immediately, please click on “BUY NOW” and select MP3 download below. This will lead you to our paypal checkout. Once payment has been approved there will be a link to “Return to loiskramerperez.com”. This will lead you to the download page.